Learning spaces. 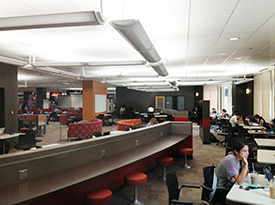 The academic library is reinventing itself as a learning space for 21st century students and faculty. A generation of students now enters higher education having embraced online, mobile, anytime, anywhere access to information. 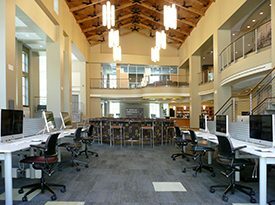 At the center of an academic community that increasingly values intellectual collaboration among faculty and students, and learning in and out of the classroom, the 21st century academic library continually recreates itself as a place that fosters curiosity, engagement, collaboration, and lifelong learning. Community engagement. The library user community can be a rich source of planning information. It is important to ask library users what they want from the library, and whether or not they are getting it, with the aim of continually refreshing and renewing library spaces to enhance learning, inspire scholarship, and foster community. User experience. There is inspiration and value to be found in the best practices and innovations of the commercial, retail and even entertainment sectors. We have all been customers, and can rethink our approach to designing services and facilities based on a deeper and more nuanced understanding of that shared customer experience. Education and lifelong learning. Inspiring and supporting individual, group and community experiences that produce lifelong memories, and inform thought and behavior long after those experiences are over, is as good a working definition of the enterprise of higher education as one might hope to find. The 21st century academic library will continue to be a central component of that enterprise. 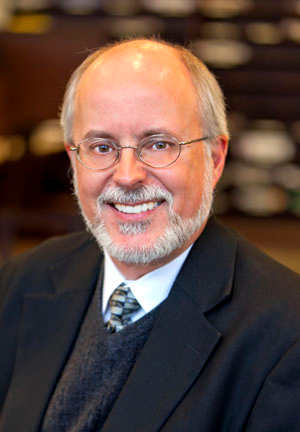 Charles Forrest has more than 35 years of experience in academic and research libraries. After nearly a decade with the University of Illinois libraries in both Chicago and Urbana-Champaign, he went to Emory University in 1988 where he held a series of administrative positions in the Library, including director of instructional support services, director of planning and budget, and most recently director of library facilities. Charles retired from the University in May 2016. This 12K SF, $650K renovation of the Woodruff Library entrance level (L2) kicked off a multi-year project designed to refresh the Woodruff Library’s Leaning Commons. The project aimed to create and update library public space to support individual and collaborative work by students, and respond to the requirements of an emerging BYOD (bring-your-own-device) technology-enabled active learning environment. Charles served as library project manager and liaison for the Phase 1 renovation. 1970 library building and added a two-story addition that increased the overall square footage by more than 50%. The project transformed an out-of-date, overcrowded library into a spacious, functional twenty-first learning space for the Oxford academic community on the original Emory campus. Charles served as an internal consultant during all phases of planning, design and implementation. 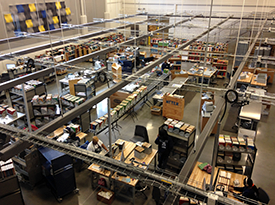 A joint initiative between Emory University and Georgia Tech, the 45K SF, $27M Library Service Center (LSC) was planned and built to house offsite collections from both libraries. Operated as a single resource for both academic communities, the LSC operates a regular retrieval and delivery service that makes all items equally available to any user on either campus. Charles served on the project Steering Committee and other project teams, and served as project liaison to Emory’s Planning, Design and Construction Office.